Hope you all had a good Burns night last night. "Ah kent the boy, ah kent him weel." "Well sir, well now, gee! as a star like him, I see!" but I'll put you right," said he. I'll dae it fine for free!" - he'll loathe himsel', like me." The Homecoming is coming! What is the Year of Homecoming? Set up by former First Minister Jack McConnell, it was decided to make 2009 - the 250th anniversary of Robert Burns' birthday - as a Year of Homecoming. A call would go out to global expats and people with 'affinity' to Scotland, calling them to come back home or, at least, to visit. The concept would revolve around five main themes - Burns, golf, whisky, inventions, and ancestry. Thousands of events scheduled between Burns night (25th January) and St Andrew's Day (30th November) have come under the Homecoming umbrella - some around the five main themes, though most are events that were happening anyway (like football's Scottish Cup). Completely by chance, the timing of the Year of Homecoming could not be better. With the plummeting value of the pound and poor prospects in 2009 for the UK economy, there is no doubt that hopes for any bright spots this year are being pinned on tourism. So it is a happy coincidence that the government has been thinking for the last couple of years about bringing more visitors than usual to Scotland. I too have been thinking about this coming year - I've even written a tune for it. So on Burns Night I will publish a poem about expats. Tune in to read it! I've just finished reading (well, ogling) a Colin Baxter picture book about Shetland, 'Land of the Ocean'. The seascapes are magnificent - you can almost taste the sea spray, feel the wind on your face. I'd love to now visit, for the first time, Foula and Fair Isle. Of the Shetland places I've been, Colin's pictures of Eshaness in particular grab me - it is one of the great beauty spots of Scotland, if little known. One winter I went to Eshaness and was struck by the great wild beauty of the coastline. Standing at the lighthouse, you look south to Dore Holm, and north to pounding rollers crashing against the low black cliff. Inland, the sea has created a vent hole in the brown moor, although it was not stormy enough to come crashing out the top of the hole. A short distance offshore lay two small islets - the lower one swamped by every wave, the higher, splashed by every occasional wave. Curious as to how high the islands were - perhaps I could gauge wave height by finding out - I consulted the map. The lower island was 27m high, the higher island 39m. The waves were over one hundred and twenty feet high! Nervously, I checked the height of the lighthouse - 50m above sea level. I backed away from the edge. We had booked a flight back to Glasgow from Sumburgh a couple of days later but it was too windy for the plane to land, and so found ourselves shunted on to the next boat back to Aberdeen instead. This was a large new ferry, the Hjaltland, with impressive seagoing characteristics - it barely rolled in the heavy seas. In the bar I got chatting to a Norwegian. "The weather must be even worse in Norway," I said, thinking of its northern latitudes. "You must be joking." he replied, an Oslo urbanite. "This is the middle of the ocean!" One of the more intriguing and less known places in Scotland is Fife Ness. I've always liked the name - it suggests that 'fife' is an adjective, that one could have a quality called 'fifeness' - but it is really just the Norse word for a peninsula, and Fife Ness is the end of the land. Unlike many British headlands, it does not stand proud on cliffs above crashing waves: instead, the unspectacular low ground of East Fife slips without fanfare into the sea, and a boxy little lighthouse and residential-looking caravans mean that the picturesque vernacular architecture of the rest of the East Neuk is not replicated at its extremity. Yet Fife Ness has atmosphere in spades. Here, sky, sea, and land intermingle in equal measure. The air is dry and light. A windy links golf course looks across the sea to Arbroath and the snow-covered Angus hills. Long dykes of rock finger into the sea, and are revealed on the shallow shore at low tide, with shipping beacons sitting on the treacherous Carr rocks just offshore. Seabirds are innumerable, and oystercatchers peck away on the glistening dark beach below the hermit's cave, cell of an early Celtic saint. The area also played a small part in early Scottish history - when a group of Viking adventurers known as the Dubh Gall (the Black Strangers) were expelled from Dublin by the Irish king in 877, they ended up digging in at Fife Ness. Danes Dyke, that cuts this very tip of Fife off, is named after them. King Constantine I went to fight them, but was, according to legend, killed by them in the hermit's cave. This is the place to come in winter: to watch the sea birds, get the wind in your hair, and escape the darkness of the clouds and hills in the rest of Scotland. Not especially Scottish, but I liked this too much not to share! Kalimedia, based in Germany, has produced an Atlas of True Names. What does this mean? Each placename in the atlas has been taken back to its root language, and translated into English. The results are variable: for example Beinn Nibheis, the highest hill in Britain, does not have one definitive translation: experts disagree over whether it is venemous hill or hill with head in its clouds: the atlas shows it as Mount Malicious. But as a start, it is a fascinating look at the placenames that we just take for granted. 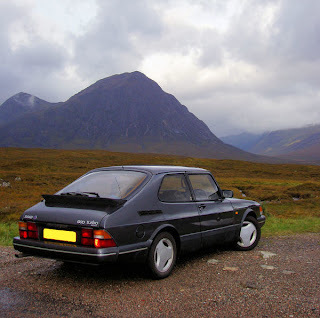 My car is 21 years old - a 1988 Saab 900. I've always liked the shape of old Saabs, and running an old-ish classic is a cheap - if time consuming - way of enjoying motoring. The underside is coated in tar, so hopefully rust will be kept at bay and it will keep running for a few years yet. Had I wanted to run a Scottish car, what could I have? Apart from the extremely rare Argyll Turbo GT, the only one I can think of is the Hillmap Imp, the youngest of which would be 33 this year! In the late 1950s the government decided to stimulate industry in Scotland, and encouraged Coventry-based company Rootes to build a car factory at Linwood near Paisley. The UK had always concentrated motor manufacturing in the Midlands, but post-war governments were more socialist in character than modern ones, and opening a factory in Scotland was seen as a way of distributing the jobs around. 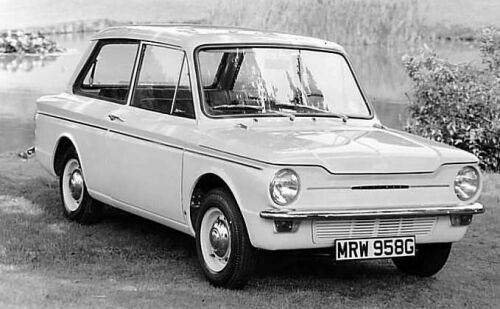 A small car with some advanced and quirky features for the time was designed - full synchromesh, aluminium engine, fluid suspension - and went on sale between 1963-1976. Unfortunately it had a reputation for unreliability, and never reached the levels of sales of classic designs such as the Mini. The factory at Linwood, scarred by industrial disputes from the start, shut down. However, 440,000 Imps had been made, and it had a fuel consumption of 60mpg. In these environmentally conscious times, perhaps it is better to run old cars like the Imp, than waste resources manufacturing plasticky, characterless new ones? Way back during Edwardian times, there was an explosion of car manufacturing in Scotland - Arrol-Johnson, Argyll, Albion, and Beardmore were successful for a time - but these manufacturers all disappeared before the Second World War due to poor sales and consolidation and specialisation of manufacturing in the Midlands. Thus there has been no auto industry in Scotland since the demise of the Imp, and the nearest car manufacturer is Blackpool's TVR - whose products are sadly out of my price range. "Oh - I thought you were Polish," said the man behind the shop counter after I spoke. "Do I look Polish?" I asked. "Well, my grandfather was from Poland." Since Poland (and nine other countries) joined the EU in 2004, Britain has had an unprecedented influx of Central Europeans. The majority are Poles, and many who are not are simply assumed to be Polish. Most of the immigration has been to the UK and Ireland, with London, Edinburgh, and the Highlands being noteable hotspots. The reason for this is that of the old EU countries, only the UK and Ireland allowed free movement to the citizens of the new EU countries. The likes of Germany and France were worried they would be swamped by Slavic hordes, and placed initial limits on internal EU movement. Thus the most go-getting of the new EU citizens have been pouring into Britain and Ireland since 2004. Foreigners often have certain stereotypes to live up to, and Poles have had the good fortune of being assumed to be honest, hard working, and skilled tradesmen. While this might not be true in every case, the stereotype has been strong enough for at least one enterprising Scotsman to advertise his services recently as 'Polish Plumber'. But most Poles are not planning to stay. Poland is co-hosting Euro 2012 with Ukraine, and there is a lot more work there than there was in 2004. In a way this is comforting, a validation of the EU as an improver of the European standard of living. These people are not refugees: they have chosen to come to the UK to work, but many will go home as their own countries become more prosperous. Perhaps then, as in the 16th and 17th centuries, the flow of people will run the other way; and Scots will be travelling to Poland and the Baltic for work?